After preparing for weeks, the Pelham Bookworms’ hard work was going to be tested. On Saturday, October 21st, all seven members marched into Hendrick Hudson High School in Northern Westchester County, ready to compete in the Fourth Annual Battle of the Books (BOB). Matthew’s mother, Tracy Doka, commented, “The Battle of the Books is a great event that encourages reading, teamwork, positive competition, and is a lot of fun.” Many parents, like Mrs. Doka, enjoy that their children take part in this activity since it engages students, and helps exercise their brain by retaining details. The five books competitors had to read for the teen competition this year were: Jackaby by William Ritter, Everything Everything by Nicola Yoon, Harry Potter and the Sorcerer’s Stone by J.K. Rowling, Michael Vey Prisoner of Cell 25 by Richard Paul Evans and Fever 1793 by Laurie Halse Anderson. Some of the many questions asked during the competition began with “In which book …?” where teams would buzz without hearing the rest of the information. Sometimes, a Bookworm team member would accidentally buzz in halfway through the question and not know the answer, but it was amazing how, through teamwork, we solved it right on time. I asked Matthew, “During which part of the competition did you feel most nervous?” he responded, “When the moderator would say that my time was up and I had to respond to the question.” Many other teammates also felt the same. The coach of the Pelham Bookworms this year was Oz Coto-Chang, who is Youth Services Librarian at The Town of Pelham Public Library. He held practices twice a week to help us prepare for the competition. I asked, Oz, “why he took such a liking to working at the library.” He answered, “I’ve been working in the library since college, and enjoy getting first dibs on the new tech coming out.” Another perk to working at the library! Oz prepared the team well, and many of his practice questions ended up being asked, so the Pelham team got a jump start on those. After a long day of in which competitors stretched their minds, the scores were written on a white board. The Pelham Bookworms got fourth place out of 23 teams competing. Rye won first place, followed by Peekskill and Ossining. For many of the team members, this was their first time competing! The Bookworms did well and most say they will join again next year. ← Light-Up Card-Making Workshop for Teens! I read this article and found it very interesting, thought it might be something for you. 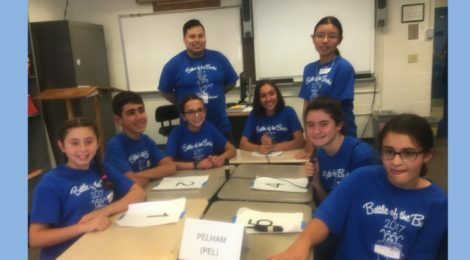 The article is called Teamwork Pays Off at Battle of the Books, by Jamie Burkeand is located athttps://www.pelhamlibrary.org/blog/teamwork-pays-off-pelham-bookworms-battle-books-jamie-burke/8578.